Wondering left and right, and before you know it, it's dawn. An intricate puzzle action game. In the dark, deep maze, reach out with your right hand and grab the key! 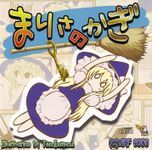 A Shrine Maiden franchise game with Marisa Kirisame in the main role.